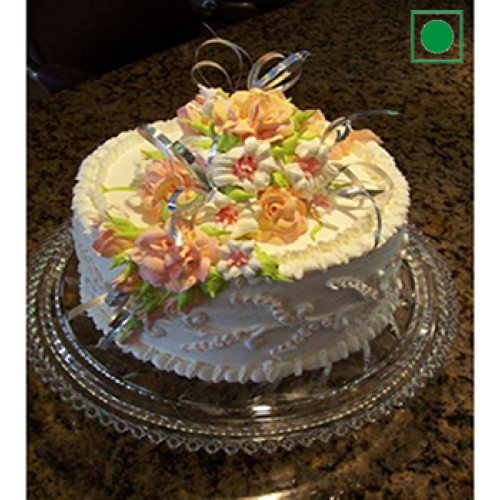 Women love flowers and what if you gift that gorgeous flower cake to you wife on her birthday. This will surely make her day special that she will treasure rest of her life. Cake: 1 Kg Cake flavour will be of your choice. This is a perfect cake of every occasion like Christmas day, Valentine’s Day, Anniversary that you can send to your family and surprise them. Your gesture will leave them spellbound. We provide delivery of this wonderful hamper across Jaipur and nearby cities like: Ajmer, Jodhpur, Alwar, Udaipur etc. You can gift this amazing hamper to your love on Valentine’s Day. You can surprise your fiancé or Better half on your marriage anniversary. Send to your family on Mother’s Day, New Year or for Christmas celebrations. Cake should be consumed within 24 hours from delivery. Delivered product might vary slightly from the image shown above. Guarantees may not apply for timings on Occasions.